An EGGS-CELLENT surprise for all at Incom-CNS! A big THANK YOU to the bosses at Incom-CNS for treating us to a wonderful Easter supriset, delivered by our wonderful Easter bunnies. 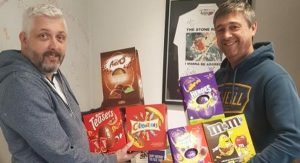 As a gesture of gratitude, the directors have treated all the team to some EGGS-CEPTIONALLY, EGGS-TRAVAGENT Easter eggs to get them in the mood for the long Easter weekend. We’ll be burning off some calories on an extended Easter egg hunt this weekend! . Wishing all at the Incom-CNS team, our customers and partners a wonderful Easter break.